Over the winter of 2018–19 there was much supping of hot beverages in the Jackdaw Works, which led to a certain amount of ruminating. In between the beverage breaks progress was made with the Welsh coach and Scottish coach, both inspired by Rowland Emett's cartoon 'spoofing' the nationalisation of British railways in 1947 – and the same cartoon inspired an Irish loco and a Northumbrian-themed wagon. Over seventy years later the country has become considerably more multicultural. The management of Whittlecreek and Eaton St Torpid Heritage Railway recall enjoying some of the music and dance festivals organised by Leicester City Council, such as the One Rhythm Dance Festival back in October 2008, which successfully brought together performers from many different nationalities. 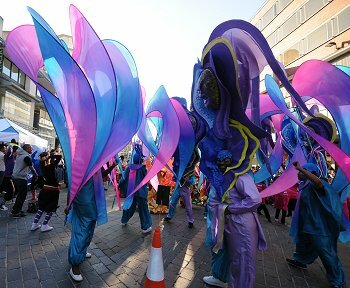 Participants in Leicester's One Rhythm Dance Festival, 2008. The manager of Whittlecreek and Eaton St Torpid Heritage Railway's Jackdaw Works said, 'Well that's rather a lot of wagons you're going to need. Hope there's a budget to build them.' And, frankly, there isn't. And heaven alone knows how all the necessary musicians might be brought to north-west Norfolk. Nigh on thirty years ago a whole colony of cajun-playing musicians infested Derby, and it seems The Bearcat Cajun Playboys are still strutting their stuff, with a repertoire of two-steps and such like. In Spring 1985 the management was on a business trip in America and drove through Church Point, Louisiana, on a Sunday morning when the famous Lee Laverne radio show featuring the best cajun musicians playing live was being broadcast – but back then had no idea what cajun music was (he was only a mere 30 years old… ) so carried on driving. And has only been to America once since, and got no further south than Pennsylvania! So, who knows? Just maybe by 2020 Whittlecreek and Eaton St Torpid Heritage Railway will have its own One Rhythm Carnival.